That is a moist yummy 'chocolatey' looking muffin! They're sure to beat the ones from the store. Oh my goodness, I love coming here! Can't wait to try these. I gave you an award at my blog. Have a sweet day! I love this recipe! I think it is sometimes called Depression Chocolate Cake. It's naturally vegan --- and I've successfully converted it to gluten-free. So delicious! I am somewhat mystified at the continuous stream of yummy desserts post holiday time. Apparently none of the Mennonite Girls who Can Cook gained weight like I did. Traditionally, Jan and Feb yea well into March are dieting months. I love this site, make so many of the recipes posted. I love looking here for dinner or dessert ideas. 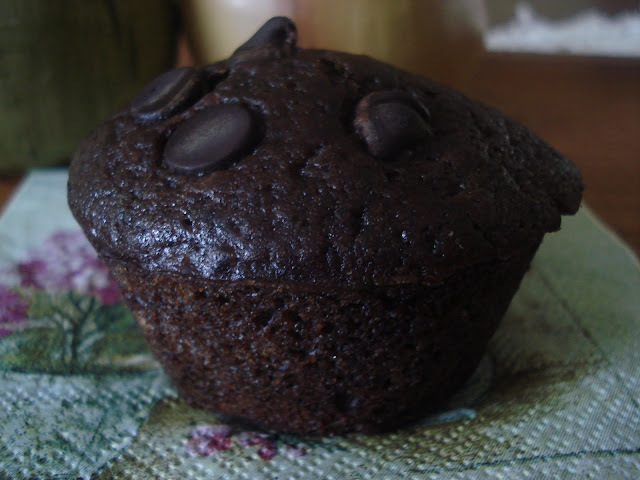 I made these muffins today, they are great, and terrific for my lactose intollerant husband (we use dark chocolate chips that are dairy free). these look so good i will definitely try them, i don't think i can get away with calling them breakfast though! Just wondering about the lack of eggs in this recipe. Is that really correct? yes anonymous, you are seeing right, there are no eggs in this recipe and it works out well.